Understanding the three Rs —reminder, routine, and reward—can help you create healthful habits. 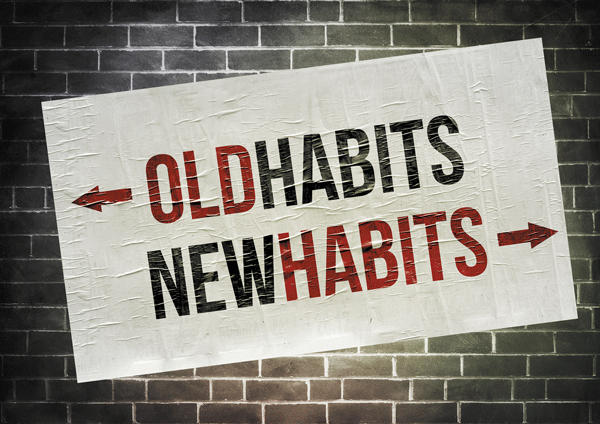 Everyone has bad habits they want to break, but instead of scorning yourself for being helpless to break them, use the fundamentals of forming habits to your advantage. Habits, good or bad, follow a typical three-step pattern. One way to describe this is as three Rs: reminder, routine, and reward. By breaking down the cycle of a bad habit, you can identify what triggers the routine and begin to address what really needs to change. This way you can establish a pattern for new and healthier habits. Engaging in habit changes for self-improvement is key to vitality and well-being at all ages, according to Margaret Moore, co-director of the Institute of Coaching at Harvard-affiliated McLean Hospital. "Summoning motivation for long-term goals gets harder when we move beyond the family- and career-building stages of life," she says. "It is normal and natural for men to feel like relaxing and letting go of the self-monitoring discipline of healthy habits, such as regular exercise and a healthy diet. But feeling good and energetic requires a daily investment in self-improvement, which begins with letting go of unhealthy habits and engaging in healthy ones." One common reason people do not succeed in making lasting change is that they don't first create a solid foundation. "You need to make sure the habit change is important and you have confidence that you can achieve it," says Moore. This might sound simple, but often people take on changes that are important to others but not to themselves, or they feel down deep that the task is too daunting. "Before you can focus on changing a bad habit, you need to measure both motivation and confidence," says Moore. How do you know when you are ready to try changing a habit? Using the "Readiness to Change" chart, rate your motivation on a 1-to-10 scale. Then do the same for your confidence level (how confident you are that you can make it happen). You want a score of at least 6 for each. "This is the foundation you need to be successful," says Moore. If you don't have that score or higher, choose another habit to change—one you may feel more passionate about—or scale back the habit change to raise your confidence. For instance, if you lack confidence to quit smoking, begin with cutting back to five cigarettes a day. "Once you build more confidence from changing a lesser habit, you can revisit a more ambitious one," says Moore. reward: the benefit from the behavior or action. Each one is linked to the others in a continuous loop. Here's how it works: Say you have a habit of eating junk food when you watch TV at night. This is the loop: Your 8 p.m. TV show begins (reminder), you go to the kitchen to gather your snacks (routine), and you eat them while you watch your program (reward). When the reward is achieved—in this case the pleasure of comforting junk food—you have a desire to repeat the action with the next reminder, and the cycle begins again. To break the bad habit, the simple solution would be to just stop eating the junk food. But, of course, this is never easy, because the real issue is the habit, not the food itself. Understand the reminder and routine. Your first step is to shine a light on what happens with the current reminder and routine. In this example, at 8 p.m. you visit the kitchen for snack foods and then get comfortable on the couch. Now ask yourself, why do you go to the kitchen? Make a list of short words or phrases that describe your feelings before you begin the routine. Hunger? Boredom? The desire for pleasure of eating while you watch? immediately preceding action: favorite TV show comes on. Write down notes about your own situation using these categories for three to five days, as some may vary (for instance, mood or time). Afterward, review the information and look for patterns. For instance, maybe you snack only when you are alone, or when you watch TV later at night, or when you are in a certain mood. Or you follow the routine of snacking only when you watch certain shows, like a comedy or drama. Do you tend to favor certain foods, like cookies, over other choices? "These are the clues to what needs to change so that you can shift to a new habit," says Moore. Boost your motivation. Next, make a list of different types of rewards you also enjoy. "The goal is not to 'punish' yourself for seeking pleasure, but to choose rewards that make you feel good while investing in your new healthier habit," says Moore. These may include taking a walk, meditating, or calling a friend, or snacks that are good for your brain and body like whole fruit, low-fat plain yogurt, or a cup of hot tea. Once you have examined your routine, the reminder that triggers your behavior, and the reward for your habit, you can figure out which factors you can shift and thus break the cycle. For example, instead of watching TV at the same time every night, use that time slot for other habits with better rewards, like exercise, reading, or participating in a hobby. If you find your snacking is triggered only when you watch TV later at night, try watching earlier the next day. If you discover that it's not the snack food you crave, but rather the act of eating, prepare healthier snacks to satisfy that urge. It may take some time, and you may have to experiment with different rewards or triggers to find the right ones, but soon you can shift your bad habit into a good one. "Once you know how to choose the habit you want to change, and break down the cycle of how habits work, you are empowered to make lasting change," says Moore. What's the purpose of the new mental health questionnaire? Lend a hand, help your heart?